ASUS today announced ASUS PadFone Infinity at MWC 2013. The Asus PadFone Infinity is a 5-inch Full HD display that becomes a 10.1-inch tablet when docked to its companion PadFone Infinity Station. Last year we had seen a similar product from Asus. The PadFone Infinity has 1.7 GHz Qualcomm Snapdragon 600 Quad-Core processor, 13 MP camera with f/2.0 five-element lens and 64 GB of storage. 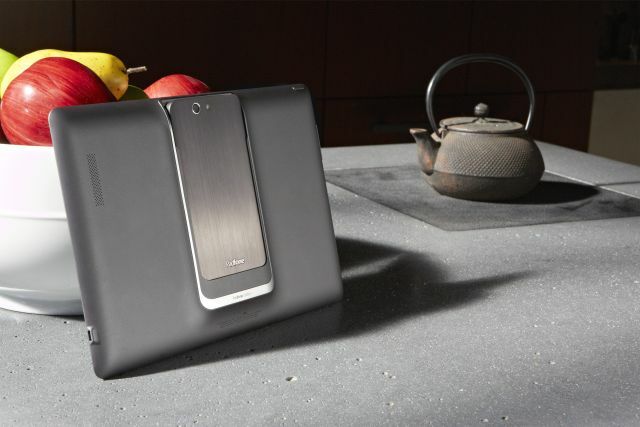 Asus PadFone Infinity crafted from aluminium and the design of the device is quite attractive. It also features a high-performance 13 MP camera with a dedicated image signal-processor enhances low-light image quality and enables you to capture up to 100 sequential photos at 8 frames / sec, while simultaneously recording 1080 Full HD video. Another good features is that you can share apps and mobile data between phone and tablet. Data & settings on PadFone Infinity are available instantly on PadFone Infinity Station upon docking and running apps are smoothly reformatted to fit the larger display. ASUS PadFone Infinity has up to 19 hours of 3G talk time, increased to up to 40 hours when docked into PadFone Infinity Station. PadFone Infinity Station also has sufficient battery capacity to fully recharge the docked PadFone Infinity up to three times. Asus PadFone Infinity will be available in Taiwan from April and other countries from early Q2 2013.